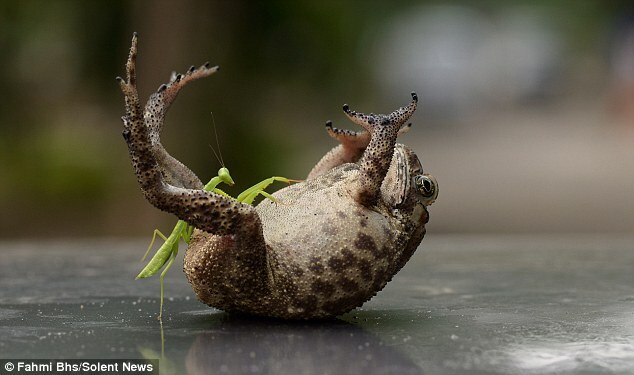 This praying mantis shows it’s up for a laugh – as it tickles a toad’s belly. The playful insect approaches the toad, which is lying on its back, and gives it a tummy rub using its tiny legs. 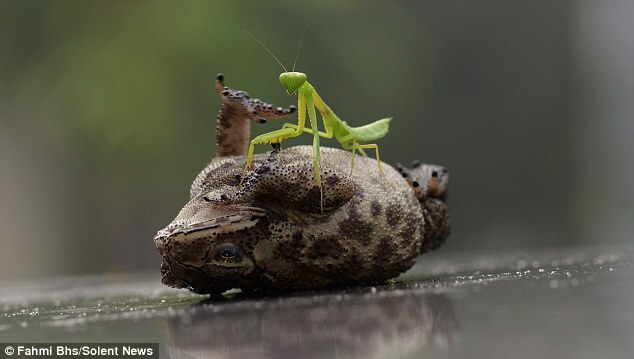 The mantis then tries to climb over the toad, but appears to tickle the amphibian before making its way across the obstacle. Far from croaking about being used as a stepping stone, the toad appears to be enjoying the attention as it lays on its back with its legs in the air. Fahmi Bhs, a director for a medical device company from Jakarta, Indonesia, captured the funny moment in his hometown. The 39-year-old said: ‘The toad was on top of my car and I tried to remove it using a small fish net. ‘The toad flipped inside the net and gave me the idea to turn it on its back while the praying mantis was there. ‘I did not know what would happen but I’m glad it was the funny moment that I wanted. The tiny insect took just a matter of seconds to climb the small bufo melanostictus. Mr Bhs added: ‘It only took the mantis three seconds to completely climb over the toad, so I had to be quick with my camera. ‘It was funny to see this kind of encounter with small animals and I found their unexpected behaviour amusing.